After a long wait and what seems like endless speculation, Google Maps for iOS has finally landed in the App Store today, and you can download it here. The company has packed it full of features and also, crucially, it has launched an SDK that gives developers a chance to integrate it into their iOS apps – read on for more. The application comes with all the usual Google goodies, which includes turn-by-turn navigation, public transit directions, Google’s own unique Street View system. The application allows users to enjoy voice-based, turn-by-turn driving instructions and live traffic information from across the world. Google includes train, bus, subway and walking directions — as it does on its regular and other maps services. The update is still making its way across the various country apps stores across the world, so users outside of the US and other markets may have a little bit of a wait on their hands. 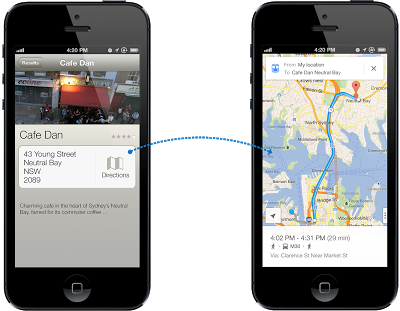 What’s really interesting is that, with this update, Google has also launched its own Maps SDK. This is a potentially very significant development since it will allow iOS developers to bypass Apple’s own mapping system and feature Google Maps in their apps, while they can also link their apps to the Google Maps iOS app too. Based on that we can expect to see some very cool linkups and, perhaps most importantly, increased competition between map makers, which can only lead to more accurate, feature-filled apps and services for iOS device owners. Andrew Foster, Senior Product Manager, Google Maps, explains about the technology behind the service on Google’s Geo Developers blog.